ENGLEWOOD, CO. – April 10, 2019 – An historic mid-March “bomb cyclone” weather event, coupled with epic Colorado snow totals, tempered the typical fast start to the spring housing market in Denver and across the state, according to the latest monthly market trends data from the Colorado Association of REALTORS®. New listings for single-family homes, as well as condo/townhomes, rose 23 percent from February to March however, the new single-family listings are down more than 2 percent from March 2018. New condo/townhome listings are up nearly 11 percent year-over-year. Total active listings dipped for both single-family homes and condo/townhomes over the past month, 6 percent and 7.2 percent, respectively. However, there were nearly 21 percent more condo/townhomes on the market in March 2019 over the prior year. Year-over-year sold listings were also down in March, -3.4 percent for single family and 4 percent for condo/townhomes. Despite weather and other seasonal factors, the median sales price of a single-family home in the Denver metro area rose 3.5 percent from February to March and is nearly 2 percent higher than this time last year. The median price of a Denver-metro area condo/townhome rose about a half a percent over the past month and is 1.7 percent higher than this time last year at $299,900. Sellers of single-family homes and condo/townhomes continue to receive more than 99 percent of the list price while days on market has once again begun to fall – 36 days for single-family, 32 days for condo/townhomes. New listings for single-family homes rose more than 22 percent from February to March but remain down nearly 11 percent from March 2018. Condo/townhome new listings also rose 23 percent for the month and are 3.4 percent above where we stood at this time last year. The overall statewide inventory of active listings fell 6.5 percent from February to March with just shy of 13,200 single-family homes and more than 4,500 townhome/condos. Those numbers reflect a nearly 7 percent decline for single-family homes compared to this time last year while the condo/townhome inventory is up nearly the same 7 percent. Single family home sales were down nearly 6 percent from March 2018, while condo/townhome sales slipped almost 3 percent from a year prior. Pending/Under Contract properties were up for both single-family homes and condo/townhomes, 2.4 percent and 13.7 percent, respectively. The median price of a home ticked up 2.1 percent from February to March 2019 to $393,088 and is up 3.2 percent over last year. For condo/townhomes, the median price remained flat month-over-month but is up 1.8 percent from March 2018 at just over $275,000. Single-family homes did start to move a little faster in March across the state remaining on the market an average of just 52 days. Condo/townhomes came in at 47 days on market for March, a more than 20 percent improvement over this time last year. “Finally, it is looking like the spring selling season is here. Looking across most Aurora zip codes, inventory is down slightly, and prices are up about 4 percent over March 2018. Interestingly, the sold listings are down about 7 percent from this time last year. Our median home price is $380,000 for single-family residential. Taking a look at the condo/townhome market, inventory is up over March 2018 and pricing is up 8.7 percent as well while the number of sold properties dipped slightly from last year. Our snowy March did not help with spring sales for condos or single-family homes and our current conditions provide a few more choices for buyers and the need for sellers to be priced appropriately. “Taking a look at Centennial, the month of March saw inventory rise 47 percent for single-family homes with prices up about 1 percent to a median home price of $483,500. Sold listings are lagging behind the March 2018 numbers. Again, this could be due to the crazy March weather. The condo/townhome inventory in Centennial was also up 63 percent with prices ticking up slightly. Despite those figures, the number of sold condos in Centennial was up 117 percent over last year. Our market continues to be strong. Buyers are getting more choices and more opportunities to take advantage of the great interest rates,” said Aurora-area REALTOR® Sunny Banka. “From a boots-on- the ground perspective, the spring market has heated up and the action has started. However, the sales statistics show a sluggish – even boring – market. In Boulder county, new listings are slightly up but prices are about even with what they were at this time last year, or even a bit lower. For sellers who expected appreciation over the past year, education on the real numbers is imperative for those homeowners who need to sell this year. Even the more affordable townhome market is showing losses in appreciation from this time last year. Inventory is still low and days on the market remain under 55 days, indicating a strong market, but only for those properties that are priced properly. “Broomfield County homes show a bit more activity with new listings up 35 percent and prices holding just at, or a little above what they were last year. The townhome/condo market remains the shining star with more sales and actual appreciation of about 6 percent since last year. Quick sales – under 41 days for houses and 21 days for townhomes – are in line with a more typical spring market. Proper pricing and position in the market is key for those homeowners who are hoping to sell this year,” said Boulder-area REALTOR® Kelly Moye. “It looks like the Spring market has finally decided to take off. It was a slow start at the beginning of the 2019 season for Brighton and the I-76 corridor, but the March market shows promise with the average price up 4.6 percent from the beginning of the year. Brighton and the surrounding areas are still showing prices lower than the rest of the metro area. If Spring fever has hit and you have an itch to move, our area may be one that you want to check out with inventory up 21.8 percent from a year ago,” said Brighton-area REALTOR® Jody Malone. “The Colorado Springs area housing market is still remarkably strong. The month of March 2019 had the highest year-to-date single-family/patio home sales volume, the second highest number of year-to-date sales, the third highest number of monthly sales, and the highest monthly average and median sales prices compared to any month of March, ever. Month-over-month, single-family/patio home sales were up 33 percent, new listings were up 26 percent, and we saw a 34 percent increase in the sales of homes priced between $200,000 and $600,000. “In the month of March, the days on the market were 36 days, the sales price to list price ratio was 99.6 percent, and the average sales price was $351,000 with a median sales price of $315,000. Last month, 75 percent of the single-family/patio homes sold were priced under $400,000, 14 percent between $400,000 and $500,000, 10 percent between $500,000 and $800,000, and under 2 percent were priced over $800,000. Pathetically low inventory – just 1.2 months’ supply – and ever-soaring prices continue to be the most challenging aspect of our housing market,” said Colorado Springs-area REALTOR® Jay Gupta. “The Pikes Peak Region continues to be strong seller’s market in the early part of 2019 as we experienced a decrease in new listings in both the single family and townhome/condo markets this past month. This scenario led to prices pushing up as inventory remains tight throughout the first quarter. Buyers will continue to feel a pinch on their pocket books as higher prices and the challenge of competing offers can wear you down. “Keeping an eye on the national economy, we watched auto sales drop for the ‘Big 3’ and Tesla. Worldwide freight has also experienced a drop and several countries approach recession type numbers. These factors have stalled any potential interest rate hikes that the FED had been discussing for the remainder of 2019. All of this is an added bonus for the housing markets, as well as the large amount of consumer debt that is out there. At this moment in time, housing appears to be on a strong path for at least the next quarter. But there are many global economic indicators that have people nervous. It’s going to be an interesting year,” said Colorado Springs-area REALTOR® Patrick Muldoon. “Spring is here and neither like a lion, or a lamb, evidence mounts that we have experienced our peak already. Denver’s median price remains in a statistical tie to that of last March with less than a half of a percent difference and a significantly higher amount of days on market. With 50 percent more days on market than March 2018, according to new data by the Colorado Association of REALTORS, homes are beginning to rest on the market a little longer, giving the long-bewildered buyer an opportunity to shop around. It’s not time to call in the panic patrol just yet though as the median price remains 16 percent higher than March 2016,” said Denver-area REALTOR® Matthew Leprino. “The housing market data for the State and Denver-metro region would suggest that our market was a bit sluggish to start 2019. Inventory is seeing some increases and days on market are up. The metro region shows new listings up 8.8 percent compared to last year and total active listings up 6.6 percent. Statewide, we’re experiencing a slightly different environment with new listings up just a half of a percent (0.5) and active listings are down 3.8 percent. Days on market increased to 51 days compared to 46 days last March for the Denver-metro region. The most exciting number might just be the pending/under contract, both for the metro area and State, up 10.8 percent and 5.1 percent, respectively compared to last March. I believe that this scenario suggests that sold listings will recover in the next couple of months, after being down in March, both for the State and metro Denver. The bright star in the market is for that first-time homebuyer or investor who has wanted to get into the condo/townhome marketplace. Active listings are up across the state giving homebuyers and investors more choices and, with appreciation slowing down, helping with affordability. The months’ supply of inventory and days on market have both increased, contributing to the appreciation slowdown. Sellers beware when pricing your properties, don’t get too greedy. Being too aggressive in your initial pricing you’ll likely find yourself still owning that property 30 to 60 days later but, if you take a more conservative approach and enter at the current market value or slightly below, you should experience a quick sale at or over your list price,” said Denver-area REALTOR® Karen Levine. “March was very similar to our first two months of the year with lots of snow and reduced activity. Listings continue to be down over 25 percent from the previous year, again due to the adverse weather conditions when compared to the year before. March closings for single-family homes were down about 13 percent, which is about what we expected. Prices remain stable with the median price sitting up about 4 percent compared to last year. The townhome/condo market experienced about the same as single family with a decrease in overall March activity, new listings were down 13 percent from last year. The 8 percent increase in median price can be attributed to a few high-end sales on the river and at Purgatory Resort. “Spring is beginning to show itself, and with warming temperatures, real estate activity is increasing daily. We’ve had 87 new listings hit the market in the last seven days. Durango has a lot of pent-up demand both on the buyer and seller sides due to the 416 Fire last summer and the epic winter we experienced. April is off to a great start with increased inventory and a good amount of buyer activity. Durango had a very active spring break – our epic snow has consequentially brought high tourist counts to town, which we are hoping will result in second home purchases later this year. With the reservoirs filling and our mountains greening, we are gearing up for a very busy tourist and selling season this summer,” said Durango-area REALTOR® Jarrod Nixon. “The Estes Park single-family market is hoping for a defrost from our long, frozen winter. New listings are at a frigid 27.6 percent below this time last year. Closed sales have slowed, and the average sale price has followed suit with a 6.3 percent dip compared to March 2018. Days on the market have reduced slightly (-4.4 percent) indicating a warm up is on the horizon with less inventory aiding a desirable market. “The townhome/condo market seems to be capitalizing on the low inventory of single-family residences with higher prices coming in. 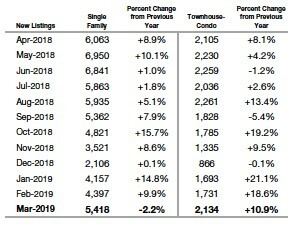 Townhome/condo new listings are up 21.6 percent from March 2018. Closed sales are on the rise (15.8 percent) over last year and the average sales price climbed 17.4 percent. Days on the market remains competitive at 79 versus 109 for single-family residences. Drake is also seeing a dip in new listings, and closed sales dropped 25 percent over last year. “Being a small community with just 4 total listings in March 2018 and 3 in March 2019, the percentages are easily changed. Average sales price is on the rise to $302,500, an 18 percent increase from last year. Days on the market was comparable to Estes Park at 108. Glen Haven is generating heat with an increase in new listings, closed sales going up and days on the market nearly unchanged over 2018. Average sales prices are impressive with the average single-family home fetching $535,000, a 17.6 percent boost over last year. While the Estes Valley is awaiting ‘the thaw,’ the market is buzzing with anticipation and energy,” said Estes Park-area REALTOR® Abbey Pontius. “The Opening Day of Major League Baseball season along with shouts of ‘Play Ball!’ conjure up all sorts of emotions; senses of optimism, renewal, hope, and anticipation of the coming spring and subsequent summer. For the last decade, Opening Day in this sense has also marked the beginning of the peak selling season in real estate. Buyers and sellers wake from the sleepy hibernation of winter and find themselves in need of a change and often it is a change in housing. “The numbers for March are certainly edging toward what may be another robust spring selling season across the Front Range. In Fort Collins, active inventory continues to increase providing greater choice for buyers. Demand for housing remains strong and with the recent drop in 30-year fixed rate mortgage rates, buyers are seeing an increase in their buying power. With the announcement by the Federal Reserve that there won’t be any further increases in 2019, we may see mortgage rates stabilize as a result. A renewed optimism can be felt in the market that lagged a bit during the winter months. “That being said, demand is still high and median prices continue to climb. Fort Collins has seen the median price climb to $425,000 (up 3.7 percent from this time last year). Even with a double-digit decline in the number of sales year-over-year (-11.1 percent), we are seeing substantial increases in the number of units sold in the $500,000-and-up price points – as much as 18 percent increase in sales year-over-year between $500,000-$700,000! Fluctuations in interest rates have a less drastic effect on buyers in these price points and so we’ve seen gains all across this sector as move up buyers trade-in the equity in their homes to address that need for a change in housing. “In the sub-median price market, sellers are going to need to exercise prudence in their pricing strategies to entice owner occupants to make the leap to owning their own home. Competitive offers are still common in homes that have been nicely maintained and prepared for sale in combination with aggressive list prices. In many cases, we are seeing list prices flat to just slightly above the initial list prices of comparable homes from last spring,” said Fort Collins-area REALTOR® Chris Hardy. “The Jefferson County market flattened a bit with new listings down by 9.2 percent and the number of sold properties down 13.6 percent. While the median sales price increased 3 percent in March to $529,059, we’re starting to see buyers be just a little more cautious over the past two weeks and that could drive our numbers down for the month of April. As always, updated homes in a good location are the ones that are selling, as other inventory is having to come down in price and staying on the market a bit longer. Looking at the townhome/condo market, new listings have increased by nearly 13 percent, with days on market up just shy of 16 percent. The median sales price rose to $292,500 and these properties are staying on the market three days longer than a month ago. “As for Golden, prices are coming down as well, and for most townhome/condos, they are sitting longer on the market unless they are priced to move,” said Jefferson County/Golden-area REALTOR® Barb Ecker. “The first signs of spring for Pagosa Springs are here – melting snow replaced by greening grass. The 32 homes sold in March brought signs of green and totaled nearly the same number of home sales in January and February combined. Most of those contracts were written in February and outside of the March Spring Break traffic. Sellers who kept on top of snow removal reaped the benefits of an under- contract home, and helped achieve a 14 percent increase in March sales, year-over-year. “For buyers, inventory is still a challenge, down 12.5 percent. Over half of sales closed in March were between the $200,000 – $300,000 range, a typical price point for the high number of second home purchases in Pagosa Springs. New inventory of homes under $500,000 were nearly even with February listings, while inventory increased in homes priced above $500,000. Currently, over half of the 200-home inventory of is priced at $500,000 and higher, leaving a huge void in affordable housing for first-time buyers and retirees. Those sellers in the higher range home prices are finding the importance of competitive pricing to get their homes sold. Typical high listing months are yet to come in May and June. The expectation is more homes will enter the market price well beyond the historical average median price of $310,000. As more and more people discover Pagosa Springs and its beauty, both buyers and sellers (local or otherwise) will need a savvy pricing education and strategy to achieve their selling and buying desires,” said Pagosa Springs-area REALTOR® Wen Saunders. “The first quarter of the Pueblo market is still on the down side. Listings are down 8.2 percent from 2018 YTD. Buyers are having trouble finding homes they want. Pending sales are up 5 percent March 2018 to March 2019, but down Q1 2019 from Q1 2018. All of this is affecting sales, down 16.9 percent from the first quarter of 2018. Prices are going up by 11.1 percent YTD. Percent of list price received still at 98.1 percent. Median price is at $200,000 and average at $207,278. Days-on-market is just short of three months. Buyers need to act fast if they see a home they want or risk being in a bidding situation,” said Pueblo-West REALTOR® David Anderson. “It’s springtime in the Sangre de Cristo mountains; temperatures are rising, the grass is turning green and new residential home sales popped up to a four-month high. While new listings remained stable over the past month, the median sale price increased from February to March to $247,500. Current inventory is 12 percent less than last year at this same time and year-to-date sales are down slightly from last year as well. As the temperatures rise, inventory and sales will soon follow as sales typically double from May through August. “Fremont County’s median sale price for March is at a seven-month high and shows an increase of nearly 30 percent over March 2018. New listings were down nearly 20 percent in March compared to a year prior and -5.6 percent year-to-date, but sales were up 1.5 percent for March and just over 4 percent year-to-date. We’re showing 2.7 months of inventory which has remained stable over the last two months and the community is prepared to usher in the strengths of the spring season,” said Royal Gorge-area REALTOR® David Madone. “It was a fantastic month for snowfall that resulted in some of the best powder skiing in years! The real estate market, however, was a bit less exuberant. 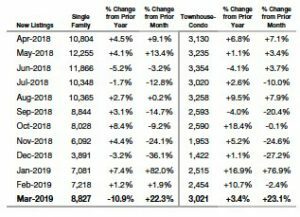 Closed sales, compared to March 2018, for single family/duplex units were down 21.4 percent and condo/townhomes declined just over 2 percent. The year-to-date numbers on single family/duplex units were a little less dramatic, down 12.8 percent and -2.1 percent for condo/townhomes. March dollar volume for all product types versus 2018 is negative 7 percent and year-to-date all products are negative by 2 percent. The combination of product mix and appreciation kept the decline in dollars to a lower level than transactions. “Our overall property inventory is down 10 percent versus a year ago, which brings the months supply of all product types to approximately 6.25 months – a low level going into the off season. We should see a historic increase in inventory beginning in late May and building for the summer sales season. “In summary, the market has been trending this way for the past year and we would project the current drop in interest rates should be a stimulus for activity in the coming months. Some of the golf courses in the valley are opening and we’re beginning to get out to enjoy the non-snow activities the valley offers,” said Vail-area REALTOR® Mike Budd. The Colorado Association of REALTORS® Monthly Market Statistical Reports are prepared by Showing Time, a leading showing software and market stats service provider to the residential real estate industry, and are based upon data provided by Multiple Listing Services (MLS) in Colorado. The March 2019 reports represent all MLS-listed residential real estate transactions in the state. The metrics do not include “For Sale by Owner” transactions or all new construction. The Colorado Association of REALTORS® (CAR) Monthly Market Statistical Reports are prepared by Showing Time, a Minneapolis-based real estate technology company, and are based on data provided by Multiple Listing Services (MLS) in Colorado. These reports represent all MLS-listed residential real estate transactions in the state. The metrics do not include “For Sale by Owner” transactions or all new construction. Showing Time uses its extensive resources and experience to scrub and validate the data before producing these reports. Accuracy and Timeliness – MLS data are managed and monitored carefully. Comprehensiveness – No sampling is involved; all transactions are included. Oversight and Governance – MLS providers are accountable for the integrity of their systems. Trends and changes are reliable due to the large number of records used in each report. Late entries and status changes are accounted for as the historic record is updated each quarter. The Colorado Association of REALTORS® is the state’s largest real estate trade association representing more than 26,500 members statewide. The association supports private property rights, equal housing opportunities and is the “Voice of Real Estate” in Colorado. For more information, visit http://www.coloradorealtors.com.